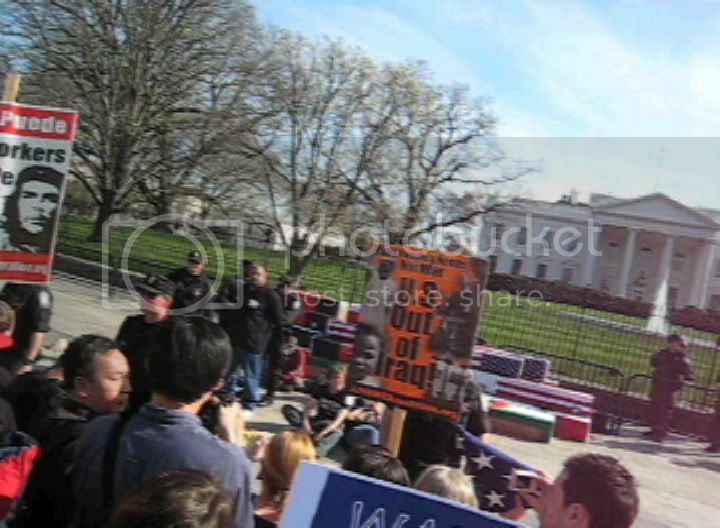 March 20, 2010, thousands of people gathered across from the White House in D.C. and thousands more gathered around the U.S. to commemorate the 7th anniversary of the illegal U.S. attack on Iraq, and to protest Obama’s continuation of the violent occupation of Iraq and Afghanistan, and other abuses of power. 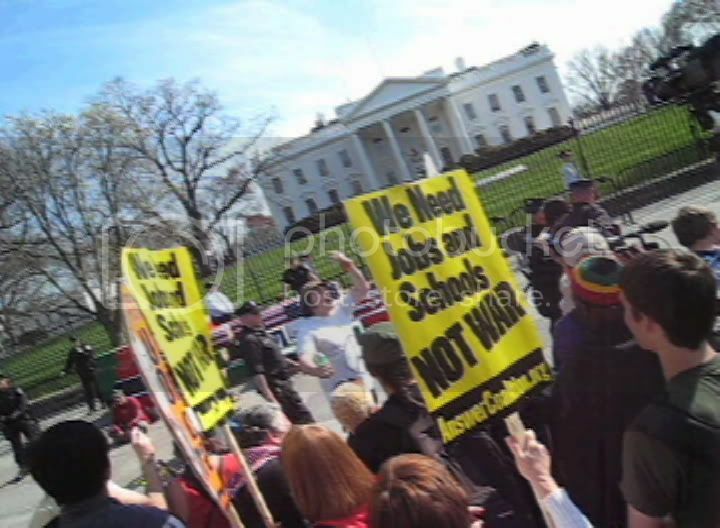 Eight people- Cindy Sheehan, Elaine Brower, Matthis Chiroux, Jon Gold, Leflora Cunningham-Walsh, Dennis Frostbutter, Alex MacDonald and James Veeder- engaged in civil disobedience and were arrested. Truth activist Jon Gold cited the 9/11 cover up and exploitation of the attacks to justify pre-emptive war as the reason for his civil disobedience. He dedicated his arrest to 9/11 victim Robert McIlvaine, Jr. and the 2971 other victims of 9/11. Cindy Sheehan has previously called for a full investigation of 9/11, and March 17 she invited truthers to participate in Camp OUT NOW. The bombing and subsequent invasion of Iraq in 2003 were justified by the Bush Administration’s false assertions that Saddam Hussein possessed WMD, had ties to Al Qaeda, and was linked to 9/11. 9/11 was the license for the attacks on Iraq and Afghanistan, torture, warrantless wiretapping, and other subversions of the Constitution- and Obama has cited 9/11 to justify continuation of the same. Given that this license for war and abuse of power (the official 9/11 narrative) has been shown to be false in many aspects; that evidence indicates the involvement of parties other than Bin Laden and Al Qaeda; and that the 9/11 Commission Report was a whitewash and effectively a cover up, it is as important to demand true answers and accountability for 9/11 as it is to demand the end to the illegal wars and occupations, abuse of prisoners and draconian security measures that have stemmed from 9/11. 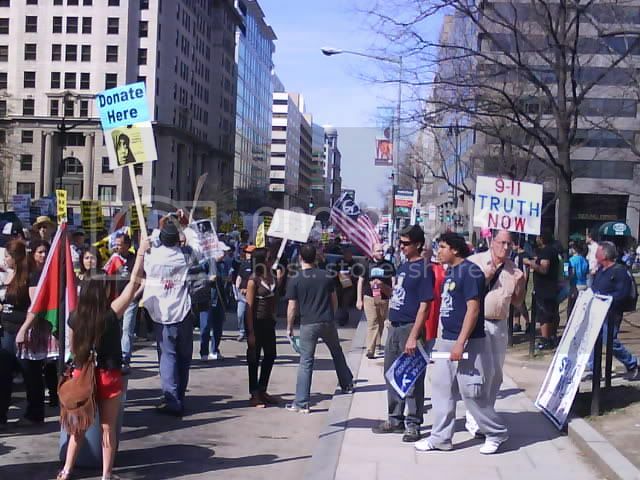 For this reason, a significant number of people at the rally had 9/11 Truth signs and were handing out materials which presented evidence and raised questions. Well over 7000 U.S. and allied troops, contractors and journalists have been killed in Iraq and Afghanistan because of the U.S. invasions. And over 8000 Afghan civilians, and at least 815,000 (possibly over 1.3 million) Iraqi civilians have died as a result of the Bush-launched and Obama-continued wars. Over 1.65 million have been injured in Iraq and Afghanistan. Again, these deaths and injuries are a result of the false information and propaganda fed to the public about 9/11 by the Democrats, Republicans and the owners of the military-industrial-financial-media complex that is profiting from war and the abuse of power. We the People bear responsibility for the death and destruction as well; this is our government, and those that serve in it are our public servants, though they may be compromised or corrupt. There was a republic, but we have not kept it, as Benjamin Franklin admonished; now we have a pretense of a republic. Many Americans believe this is as good as it gets in an imperfect world, and vote the 'lesser evil', or don't bother voting at all because the 'two' parties both serve the interests of corporations and the economic elite, and the system is rigged against other candidates. Others support independent candidates or third parties on principle, have turned to independent media and moved their money to local banks or credit unions. Many people are actively working to reform the system and increase transparency and accountability. (see links on the left side; suggestions appreciated). 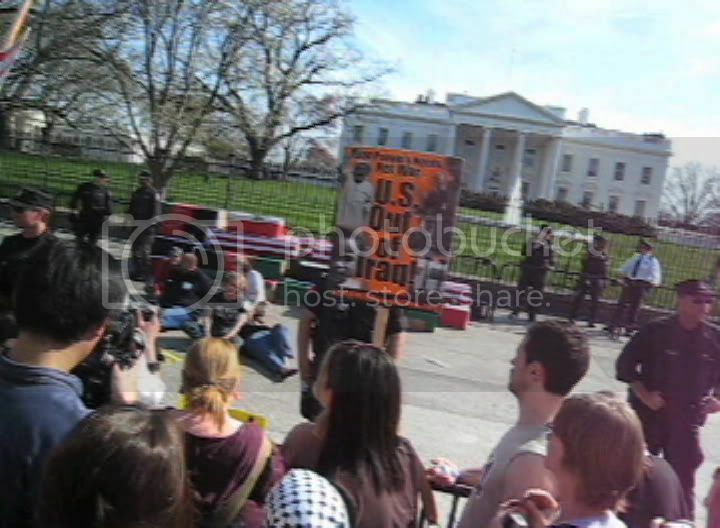 When the Iraq War was launched, a few hundred thousand in the U.S. protested, joined by hundreds of thousands more around the world. 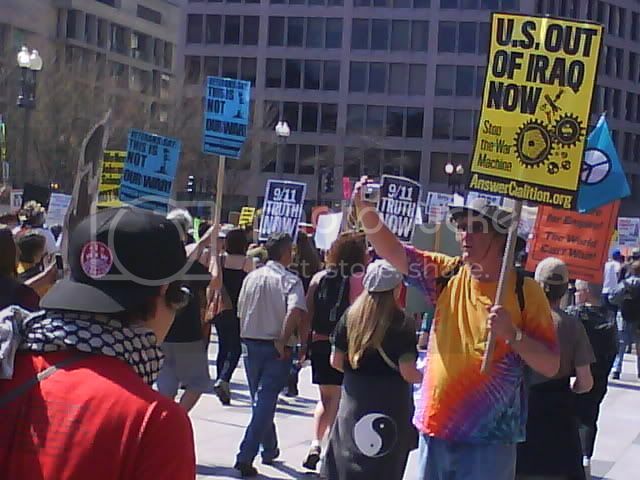 Thousands, probably over ten thousand around the U.S., protested the wars this year, but were not willing to risk arrest (myself included). Those who are engaging in civil disobedience and being arrested in order to disrupt the criminal operation of our government by corrupt special interests are putting their bodies on the gears of the war machine. Eight is not enough to stop it. Eight thousand would only slow it down for a time. Still, I find their determination and bold action inspiring, for the same reason that the actions of Rachel Corrie in Gaza and the Tank Man of Tianenmen Square and inspiring. Buckminster Fuller commented once, "You never change things by fighting the existing reality. To change something, build a new model that makes the existing model obsolete." There are over 6 billion people alive on Earth today, and hundreds of thousands are born and die every day. In the course of human history, hundreds of millions have been killed in conflicts over land, resources, ideologies and selfish designs on power. Hundreds of millions have needlessly suffered and died because money and power are valued more than love and life. All known systems of government become corrupted in human hands, but everywhere that human beings live in large numbers, people accept corrupt government as a lesser evil compared with chaos and anarchy. I don’t know what will make the “existing model obsolete,” but I hope we find it soon. MG on Mon, 03/22/2010 - 11:59am. "(would like to attach files but am unable to find appropriate icon. Thanks for assistance)"
if you register an account at an image hosting site, such as photobucket.com, you can upload pics and it will auto generate html code you can then paste in comments and blog posts, and the pics will appear in the post; is that what you meant? loose nuke on Mon, 03/22/2010 - 7:15pm. MG on Mon, 03/22/2010 - 9:50pm. MG on Wed, 03/24/2010 - 9:59am. 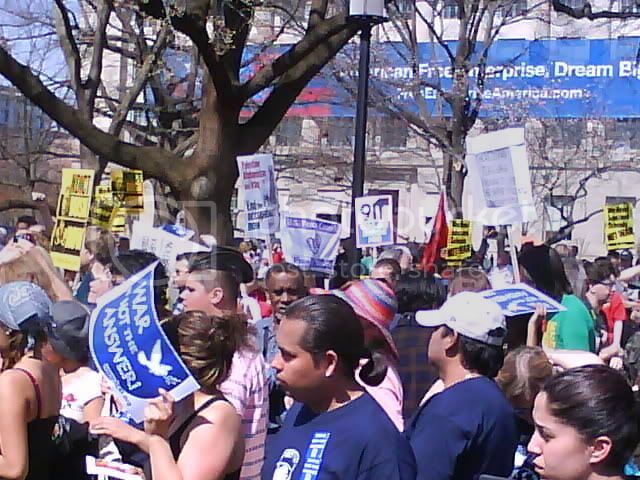 Thanks for photos,...links.SvpRemember peace activist R. Corrie. thanks for all the photos, infos and links. You say above "Still, I find their determination and bold action inspiring, for the same reason that the Tank Man of Tianenmen Square is inspiring." The chinese tank driver did not run him over. Please, lets not forget the courage of the young American peace activist Rachel Corrie who on the 16th March 2003 stood in front of the bulldozer ready to demolish another Palestinian house. She had no chance because the Israeli driver, tired of being distrupted in his work, drove over her. 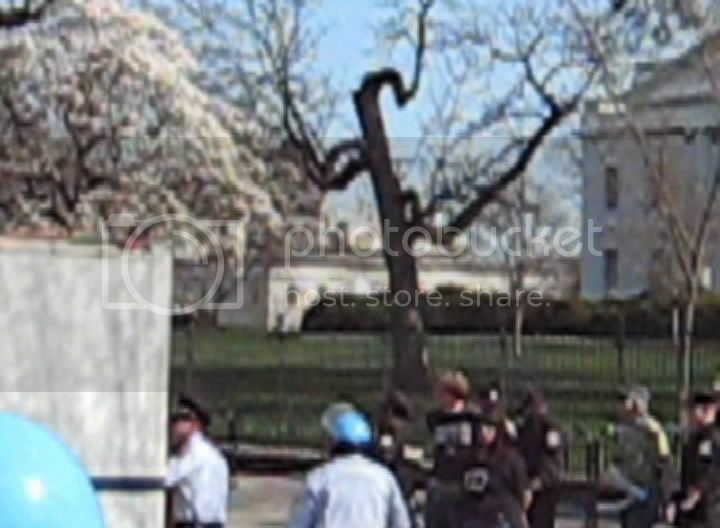 The following photo was taken just before as with the Tianenmen Square. We have not yet won peace and justice for all ! Courage to all those arrested. mouv4x8 on Mon, 03/22/2010 - 12:56pm. thanks for reminding us, mouv4x8; she literally put her body under the literal war machine. I'll include her when i update the article. loose nuke on Mon, 03/22/2010 - 7:13pm. Adam1 on Wed, 03/24/2010 - 1:41am. Here's the video of Mario Savio's speech. Danse on Mon, 03/22/2010 - 2:43pm. ...until I was reminded March 20th was the 7th anniversary of the Iraq Invasion. 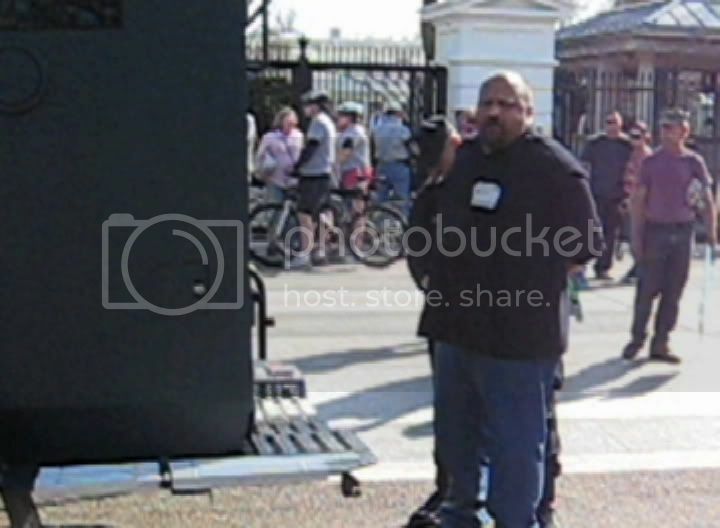 That's one way to take Cindy Sheehan protesting Obama at the Obama White House completely out of the media. Adam1 on Wed, 03/24/2010 - 1:38am. 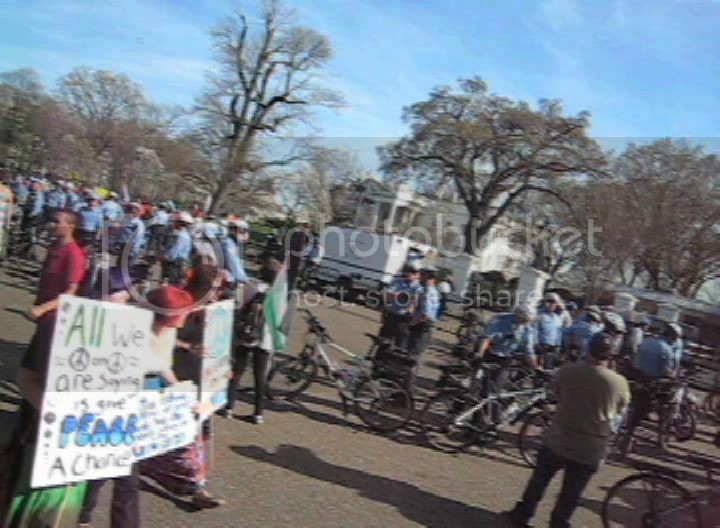 If there were 20,000 protesters outside the White House and nothing happening in the news, the media still would ignore them. bbruhwiler8 on Wed, 03/24/2010 - 1:51am.